Got questions about litter boxes? Scroll down past the products for answers! Advanced Hooded Corner Litter Box Litter box too close for comfort? Try this hooded variety! Booda Dome Clean Step Replacement Filters Great price for six replacement filters! 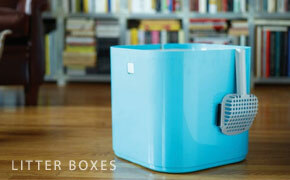 Booda Dome Covered Litter Box Available in Titanium or Linen colors. Bulk Litter Box Liner Bags A total of 240 liners! Deluxe SmartScoop Self-Scooping Litter Box with Bluetooth health monitoring system! Doskocil Litter Pan Liners 2-pack Great value for a double package! Kitty's Wonderbox 3-Pack Be prepared with these disposable litter boxes! Omega Paw Easy-Clean Litter Box Rotate the box on its side to collect solids, then remove the tray and toss the waste! PetSafe Disposable Litter Box with Litter Perfect for traveling or moving with cats! Simple Sifting Litter System Why scoop, when you can sift instead? Simply Clean Litter Box System Whisper-quiet AND eco-friendly! When we cannot find a direct supplier for something, Old Maid Cat Lady sometimes makes products available to you through affiliated retailers. Clicking on one of the ads below will take you away from Old Maid Cat Lady and over to their site to shop. They do pay us a small percentage of what you spend there as a thank-you for our referring you to them. Be aware that you cannot use Old Maid Cat Lady gift codes on other retailers' sites, nor is any percentage of your purchases there donated to our Cat Champions of the Week. If you choose to visit our affiliated retailers, we hope you return to Old Maid Cat Lady soon! 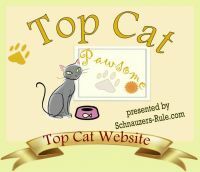 Click on the ad above to leave Old Maid Cat Lady and shop for litter boxes on the Cats Play site. Click on the image above to leave Old Maid Cat Lady and get details on the Luuup Sifting Litter Box. How big should my cat's litter box be? Standard rule is that the box should be 1.5 times as long as your cat measures from tip of nose to base of tail (not including the length of the tail). A lot of litter boxes are simply too small for a normal-sized adult cat. When in doubt, always go larger. Most experts say to have one more litter box than you have cats. This gives your kitties plenty of options when they feel the urge. If another cat has just used one, they don't have to use the same stinky box. Should I use open or covered litter boxes? Some cat experts are open-box advocates, but I have never had a problem with my cats using a covered litter box. I prefer a covered box because it helps prevent the cats from being able to kick litter all over the floor when they dig, it helps keep odors contained in between scoopings, and it just looks nicer. But if your cat is avoiding the litter box because of a fear of being enclosed in it, you may try using a high-sided box without the lid. Some cats don't like to be in an enclosed space with only one exit. That's an instinctive behavior that goes back to their wild days, when there could always be a predator lurking to grab them when they emerged. Fortunately for them, there are also some covered boxes with translucent lids, so they can see everything around them and don't feel trapped inside. Where is the best place to put the litter box? This can be tricky. Think about where you would want your bathroom to be. Not in a high-traffic area: you like a little privacy. But consider that you'll also need to be accessing the litter box frequently to keep it scooped and cleaned regularly. Make it someplace quiet and a little out of the way, but not so inaccessible that you won't be able to keep it clean. If you have multiple boxes and your house is large, put them in different places so there's one nearby if a cat has to go. Scoop it daily; if you have a lot of cats, you may want to scoop more than once a day. And every week or two, you should completely empty the litter in it, wash the box with either a product specifically designed for cleaning litter boxes, or with some water and mild soap. Then let it dry completely before refilling it with fresh litter. When do I need to replace my cat's litter box? Even the best litter boxes get scratches on the plastic from cats digging in them. Those scratches can harbor bacteria that cause odors and may eventually lead to health problems for your cats. If your litter box is showing signs of wear, it's time to buy a new one. No sense living with the stink, or risking your cat's health over a litter box! Some experts advise completely replacing your cat's litter box every six months to one year. There are also some disposable options that work, as well as liners that can help prolong the life of your kitty's plastic litter box. That's the million-dollar question, right there! It could be a number of things. The first suspicion is always a urinary tract infection (UTI), but before rushing off to the vet, examine some other possibilities. Have you recently moved the litter box, or has there been a change in the household that makes its location less ideal than it used to be? Has something else upset your cat's normal routine - for example, someone going away to college, a recent marriage, another pet, or a new baby in the household? Cats love for everything to stay the same in their environment, and sometimes express insecurity by marking their territory, usually with urine. Have you been keeping the litter box as clean as you should? Did you recently change the type of litter you're using, or did the litter add an unfamiliar fragrance? If you can find the reason for the avoidance, you can fix that situation, and the potty troubles should work themselves out. But if kitty is also acting lethargic and not showing interest in food, then yes, it's time for a visit to the vet to rule out a UTI. You may want to get a copy of Dusty Rainbolt's fabulous book, Cat Scene Investigator, that explores this very question in great detail.